If the thought of having the plaque and tartar cleaned from your teeth terrifies you, you’re not alone. People with dental anxiety avoid the dentist altogether because of their fear, but this could have detrimental long-term effects on their oral health like leaving serious problems untreated. Sedation dentistry can be used for a variety of procedures, from tooth cleanings to root canals, to ease your fears. This type of dentistry uses medication to make a your experience more enjoyable and comfortable. During the procedure, the patient is fully conscious, but in a mellow state. There are a few different types of sedation, depending on the severity of your anxiety, or phobia and the procedure. This form of sedation, also known as laughing gas, is administered through a small mask that goes over your nose. After inhaled, it takes effect almost immediately and allows you to reach a relaxed state. It’s a mild form of sedation that can aid in fillings, gum disease treatments, and other basic procedures. It wears off almost immediately after the mask is removed and is safe for people of all ages. This offers you a more moderate form of sedation to help soothe your anxiety during more complex procedures. With oral conscious sedation, you take a prescribed pill an hour before your visit. By the time you’re in the office and ready for your procedure, the medication will have kicked in. 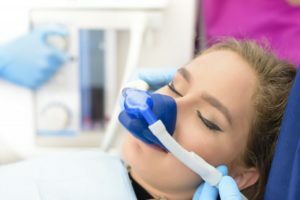 It is important to note that with this kind of sedation, you should plan for someone to drive you to and from your visit since the medication may make you groggy. This is a deep form of sedation dentistry where medicine is placed directly in your bloodstream and allows you to remain on the edge of consciousness. No matter which kind of sedation dentistry you receive, your trusted dentist will ensure that you are done before you know it. It is a good idea to communicate your fears to your dentist beforehand. Routine checkups and necessary dental procedures should not be avoided if possible. Sedation dentistry could be the answer you’ve been looking for to help maintain your oral health. Our team of experienced dentists at Advanced Dental Treatment Center share a passion for individualizing each patient’s care. They offer nitrous oxide, oral conscious, and IV sedation. By continuing their education, they’re able to provide their patients with the most up-to-date dental services. We always strive to allow our patients to see our passion for dentistry and hope that they walk out of our office with the biggest smile they’ve ever had. For questions or to schedule an appointment, visit our website or contact us at 414-209-7465.